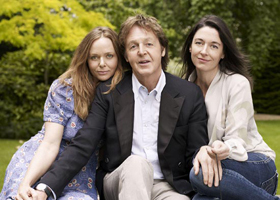 Back in 2009, Paul, Stella and Mary McCartney launched the UK Meat Free Monday campaign as a simple and straightforward idea to show everyone the value of eating less meat. With a host of prominent friends and supporters, including Sir Richard Branson, Gwyneth Paltrow, Chris Martin, Ricky Gervais, Joanna Lumley and many more, the campaign encourages people to do their bit in protecting our planet by having one meat free day a week. With menus for each of the 52 weeks of the year – two main recipes, plus four other ideas for each meal of the day – The Meat Free Monday Cookbook is aimed at everyone who cares about the environment and is happy to eat vegetarian one day a week. The following recipes have been provided to the Australian Meat Free Mondays campaign courtesy of Simon and Schuster. The Meat Free Monday Cookbook can be found at all good bookstores. A typical North African dish, try this with wholewheat couscous for a nuttier flavour. As satisfying to make as it is to eat. These cookies are crispy on the outside, and brownie-like on the inside... Just divine! The use of saffron, raisins, and pine nuts, combined with the humble cauliflower, create a very memorable pasta dish. This version of the traditional Valencian rice dish is a great addition to you repertoire of vegetarian recipes! Mushrooms are an excellent accompaniment to rösti, soaking up the delicious cooking juices. Quite simply, this is an irresistible pasta sauce with hazelnuts pitching in for added crunch. The delicious aroma of shallots, garlic, ginger, lemongrass... will invade your kitchen and transport you to Thailand! You are making two pizzas here, one topped with red onion and mozzarella, the other with butternut squash and feta. These deliciously spicy burgers are guaranteed to convert even the most committed of carnivores. This colourful dish will brighten up any dinner table. Lasagna... enough said. This one uses zucchini, eggplant, tomatoes and lotsa cheese. The combination of pine nuts and raisins with leeks is certainly a successful one. Asparagus adds a real touch of class to this simple but yummy tart.